TUG OF WAR ON BUTTE AVE.
C. J. TEAGLE OWNED THE FIRST CAR IN JOHANNESBURG. THIS IS A PHOTO OF HIS CAR IN THE 4TH OF JULY PARADE IN RANDSBUG. THE PHOTO BELOW IS ED TEAGLE WITH C.J. 'S CAR AFTER THE PARADE, IN WHICH HE WAS NOT INVITED TO RIDE. DO YOU SUPPOSE C.J. INVITED ED TO RIDE IN THE PARADE THE NEXT YEAR? 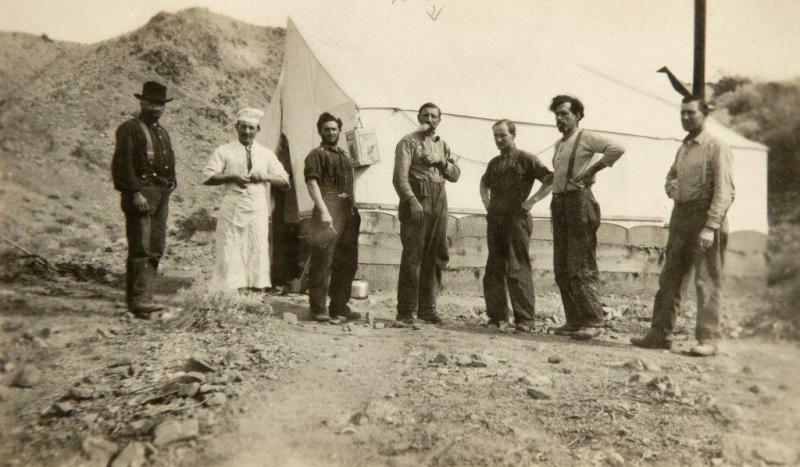 PHOTO FROM THE PETE JENSEN FAMILY COLLECTION THE COOK AND THE CREW AT THE WHITE MINE ON STANLEY PEAK IN THE RAND MOUNTAINS. CENTER IS PETE JENSEN THE FIRST DISCOVERER OF TUNGSTEN IN THE RAND DISTRICT. DO YOU SUPPOSE WORD GOT TO RANDSBURG BEFORE THE STAGE THAT THIS TENDERFOOT REUSED TO GIVE UP HIS SEAT ON THE STAGE TO ONE OF THE "GIRLS". Lower Butte Ave. This photo taken in 1898 when they were testing the new water system. Ave. It is the last building on the right as you leave Randsburg going east towards Red Mountain. It was originally a saloon. 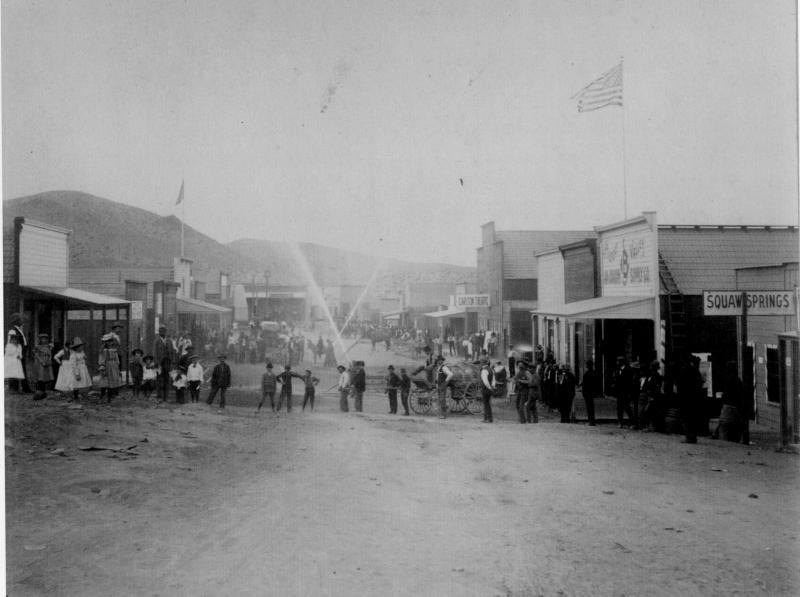 In January of 1897 it was reported that Chrisman, Cerf, and Hall from Ventura had purchased several lots on Butte Ave. up toward Fiddler's Gulch. Mr. Cerf was to open a large wholesale liquor house on his lot and the other gentlemen were also planning on putting up business houses on their lots. In February of 1897 the Kern County Board of Supervisors issued the C. Cerf Co. a liquor license. The company apparently did not stay in business for much more than a year as the minutes of the Board show than on 10 March 1898 the clerk of the board was directed to write to them and explain that the law did not permit rebating a liquor license. After Mr. Cerf went out of business the building was purchased by Morgan. 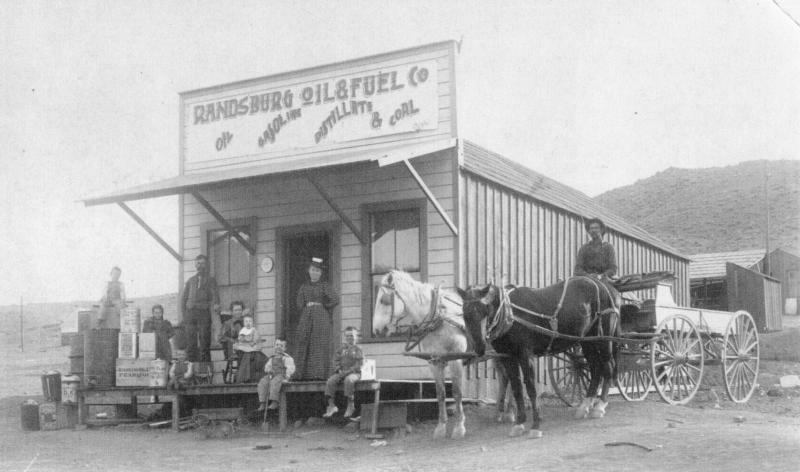 Morgan & Rogers -- Randsburg Fuel & Oil Co.
Frank Morgan came to Randsburg in the early part of 1897 and realized that there was a need for an oil distribution business. He opened a store to specialize in that product in partnership with a man by the name of Rogers. He brought the oil in to town in large tanks and provided custom made cans to his customers for their oil. The oil was delivered from a large wagon with a tank on it. He also ran a passenger and baggage wagon between Randsburg and the train station in Johannesburg. He was again shown as the owner of the business in 1899 when Geo. McPherson wrote his history of Randsburg. 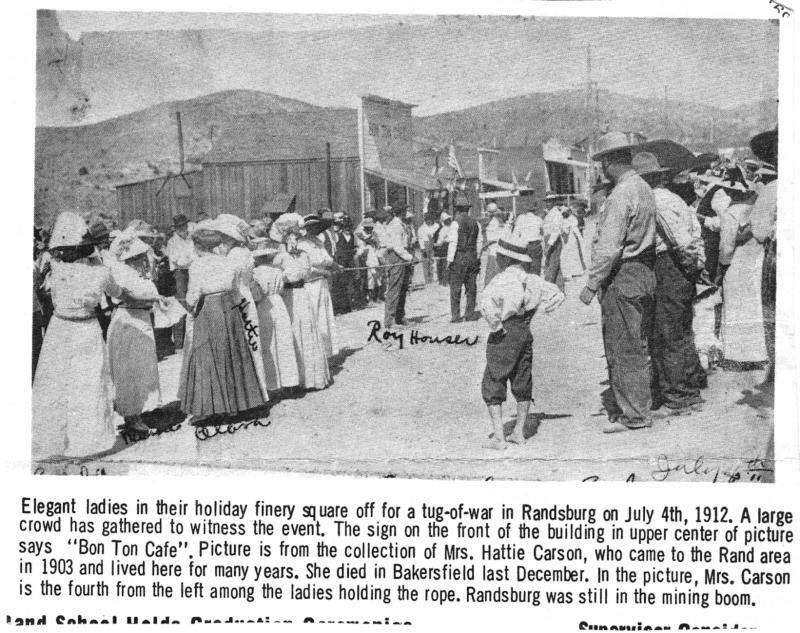 An article in the 19 September 1907 Randsburg Miner stated that he had returned to Randsburg for a visit from Los Angeles where he conducted a hotel business. According to the article this was the first time he had been in town since 1903. It is thought however that he probably was there on a visit, as he was not shown in the 1900 census or the Great Register of Voters after 1898. As late as 1920 he still owned considerable amount of real estate in Randsburg.